VEDA Associates were employed by Dyer & Butler as civil engineering designer for their platform strengthening works at Nunhead Station to extend the design life of the platform components for a period of 10 years. Historical records showed that the embankments on which the station buildings and platforms were constructed were experiencing ground movement. Network Rail plan to rebuild the station platforms in their entirety and address any global issues of embankment movement in CP6. GRIP 5 designs were prepared for strengthening works of the existing Trestle Platform, the existing Platform Cross Walls and the existing Concrete slabs. The existing precast concrete planks that form the platform deck had deteriorated due to water ingress through the platform finishes causing corrosion to the reinforcement and concrete to spall from the ribs. 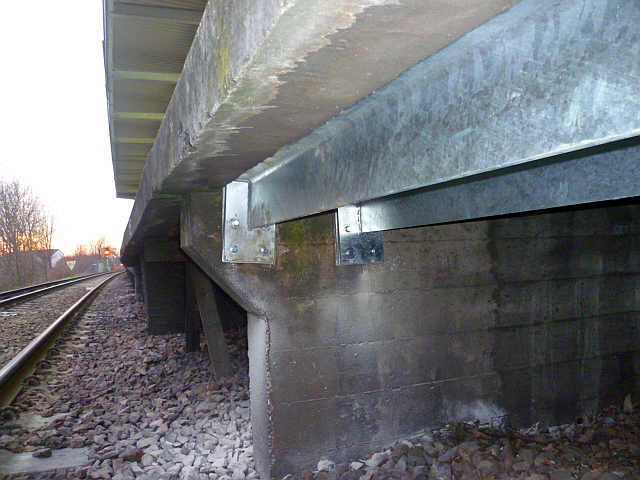 The designs outlined strengthening using a steel grillage to the underside of the existing precast units where existing members did not have a 10 years design life remaining. Installation of a manual and automated monitoring system for the platform edges and the embankment for a period of a year following the remediation work was also installed as part of the works.